On Sunday, we reported that it looked like Rockstar Games, the makers of Grand Theft Auto, was getting ready to announce a sequel to its acclaimed Western revenge tale, Red Dead Redemption. All it took was a single meaningless image—the studio’s logo on a red background—to send the internet into a frenzy. 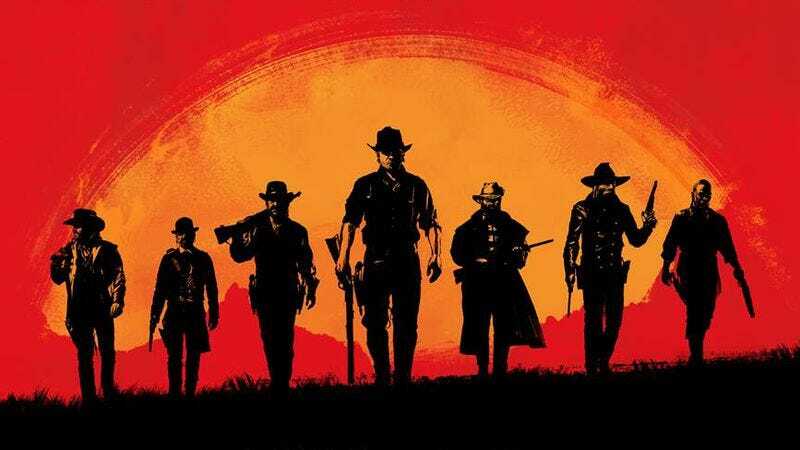 Yesterday, the developer’s Twitter account dropped another teaser, this time featuring the silhouettes of seven cowboys standing under a painted sun. And today, those figures came into full view, along with official word that, yes, this game is Red Dead Redemption 2, and it’s scheduled to be released in the fall of 2017 on Xbox One and PlayStation 4. No plans for a PC version have been announced. In addition to confirming the game, Rockstar is promising a trailer will be released this Thursday at 11 a.m. Eastern. This will give us our first proper look at the sequel, which the company describes as “an epic tale of life in America’s unforgiving heartland.” The only other firm detail right now is that the world of Red Dead Redemption 2 will also be used for “a brand new online multiplayer experience.” Rockstar has been experimenting with multiplayer since Grand Theft Auto IV, and the original Redemption, which allowed cowpokes to team up and wreak havoc across the Wild West, was an important stepping-stone toward the popular Grand Theft Auto Online mode included with GTA5. Although no specifics were mentioned, it’s safe to bet Redemption 2’s multiplayer will be taking cues from GTA Online and, given the teaser image’s cowpoke posse, be a major feature when this long-awaited sequel is finally released.